Making Wire Spirals For Beaded Jewelry. 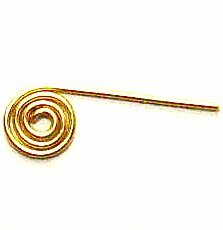 Wire spirals can be used in a number of jewelry designs and are easy to make. This type of wire work is quite often used in beaded bracelets, earrings and necklaces. Bracelet clasps quite often use a wire spiral design, are very popular, and are not difficult to bend. A spiral can be made as per the following instructions or by using special tools. There are some kits on the market that will assist you in producing a spiral. WigJig wire bending kits have an attachment that is used to make a wire spiral. Swanstrom pliers have a special wire looping kit that has a spiral bending attachment included with various wire looping accessories. 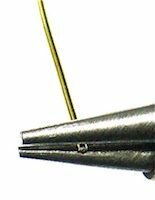 You should practice with a light gauge wire such as 22g. Move to a heavier gauge (20g or 18g) once you are happy that you are able to make them easily. These are easily made by gently bending the wire and as you rotate the wire through the pliers jaws. Hold the wire in your round nose pliers. The end of the wire should not poke out past the side of the pliers otherwise the loops will go out of shape. 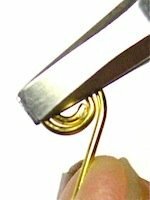 Roll your wrist away from your body to form a neat loop with the wire end nicely tucked inside the loop. Hold the loop with your flat nose or chain nose pliers. You are now going to bend the wire by gently pushing against it with your thumb. As you bend the wire you will have to rotate it after each bend until you have reached the size you want. Leave about 2cm so that you can form a loop, cut tail from loop with your side cutters. Subject to your design you can leave enough wire to make a wrapped loop or some other design feature for attachment to other jewelry pieces. You can also cut the wire and gently push the cut end up against the outside of the spiral. It is easily attached to jewelry with a wire though the center loop.